Posted by santos. This entry was posted on 20050425 at 1:07 PM You can skip to the end and leave a response. hi mrs t! i believe i'm channeling the spirit of mik--i miss her and her recipes! i just wanted an excuse to use the plate. anyway, did you make two things as well? I love that plate, Santos. I've been wanting to do a soy milk panna cotta for some time now and I love passion fruit. Thanks for the recipe. santos, what a riot of bright hues! The passionfruit pannacotta looks irresistable. But passionfruit is hard to come by where I live. Do you think mango is a good substitute? What a great way to use that plate! Panna Cotta is in the air! The mangos just look wonderful! hi julia! i couldn't find any passionfruit either; i just used a syrup. 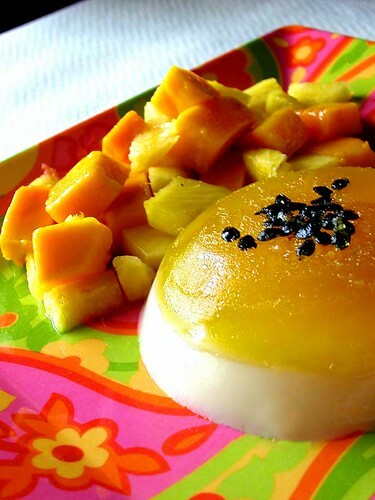 mango would be lovely substitute; i sometimes make mango jelly from overripe mangoes and mix it with almond jelly--yummy! hi chronicler! (laughing) yes, i did want to play up the plate. if i had more time, i would have added a pandan flavoured sauce to accentuate the green. As ever, your postings are beautiful and appetising.... me so jealous! Will have to try it as I've never used agar agar before. hi tanvi and vivilicious! agar agar is a seaweed derivative and doesn't quite have the same setting properties as regular gelatin--everything comes out much firmer and not quite as bouncy, you know what i mean? it's easy to find in asian markets, although traditionally it comes in a funky stick form. you can also find it in vegetarian shops (even whole foods, i think) where it's called kanten. if you are near a kosher market, you might want to look for something called emes kosher-jel, which is a kosher gelatin made from carrageenan--another seaweed derivative--so it's also vegan, and slightly more jello-like. unfortunately, not all kosher gelatins are vegan/vegetarian (they can be made with fish bones or beef skins), so look carefully on the package if you can't find emes. food fight sells it online in the us, i'm not so sure where it can be found in the uk. I made a mango pudding for this IMBB. Now that I read your post, I'm thinking I'll have to try a milk layer with it next time! Thanks for the idea. mouthwatering stuff, santos. newbie at bloghopping here, just wanted to come say hi and drool over your creations. This looks yummy. I am a huge panna cotta fan and this makes my mouth water so bad.